Leather boots are sturdy and comfortable, but they can also make a strong fashion statement. A good way to express your unique style is by customizing them with paint. Painting leather boots is a great way to update your wardrobe or breathe new life into an old pair, but certain steps must be followed in order to preserve the life of your paint job. Here's how to paint your leather boots properly without damaging them. Clean the leather boots with a soft cloth soaked in a mixture of mild soap and water. Use a toothbrush to remove dirt from any detailing or small edges that may be hard to reach. Rub rubbing alcohol over the entire surface of the boot using a soft cloth to remove surface shine. Paint will not adhere to any protective coatings that may be still on the boot. Allow the boots to dry. 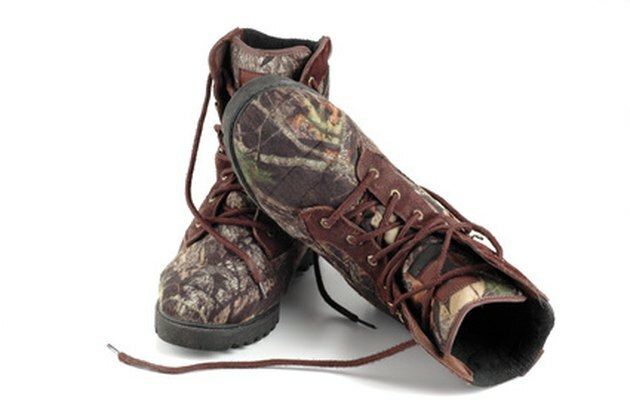 Remove boot laces if applicable and undo any buckles. Check the boot thoroughly for cracks in the leather or areas that may bend when the boot is worn; these areas should not be painted. Lay down paper or cloth over the surface of the area you will be painting on. Trace the design on the boot with a pencil. Draw the design in chalk if the leather is dark. Dip the paintbrush into paint and fill in the design by gently dotting the paint within the outline. Fix any bleeding or mistakes with a cotton swab dipped in rubbing alcohol. Let dry for 20 minutes, then add another coat of paint if the color appears too light. Air-dry the boots for 24 hours, then spray the boots with acrylic spray. Dry again for another 24 hours before wearing. Acrylic paint dries very fast so be sure to remove any painting errors as quickly as possible.